Our comfy apartment consists of a main room with double bed and sitting area, a spacious modern bathroom with toilet, comfortable shower and glass washbasin, and a modern kitchen with a large bunk bed. At the apartment includes a large covered terrace with a cozy seating and dining table with view of an idyllic garden with pond and watercourse - rest and relaxation. The spacious garden provides great freedom of movement for children: play area with a large swing and Mega trampoline, a water slide at the solar-heated pool. Our finca is characterized by a fantastic view of the sea and mountains and has the typical for the island of variety of plants and flowers. Our apartment is attached to our house. For guests who like to want contact, very suitable for families with children and for seniors. We are a German family with 2 children (15 and 19 years), German, Spanish and English speaking, and look forward to your visit. Barbecue and oven: In the immediate vicinity of the apartment is a spacious barbecue area with seating and dining opportunities. Modern electric heater for 'cooler' days. Thank you very much for meeting you ! That's the best accomodation for lovelly holiday! Tanks Patrycja - Thank you very much. You were very nice and open-minded guests. Sehr freundliche deutsche Vermieter, fantastischer Garten, Ausstatung Küche sehr gut. Empfehlenswerte FeWo, man kann auch zu Fuß (mit Wanderkarte) nach Santa Cruz gehen, dann hat man keine Parkplatzsorgen; Achtung, bei großen Kreutzfahrtschiffen in S.Cr. ist der Ort ziemlich überlaufen. Dann entweder anderen Tag auswählen oder die touristischen Trampelpfade vermeiden. Auf den Wetterdienst kann man sich nicht verlassen, am besten den Vermieter fragen. Wir waren mit unseren zwei Kindern dort und haben es sehr genossen. Die Wohnung, der Garten, der Ausblick - herrlich. Uschi und Herbert sind tolle Gastgeber, unkompliziert, hilfsbereit und liebevoll. Man braucht aber auf jeden Fall ein Auto. Das Wetter war Ende Oktober etwas wechselhaft, im Westen der Insel war es deutlich wärmer. Herzliche Gastgeber, gutes Gespür für Nähe und Distanz. Schöne Lage des Hauses mit Ferienwohnung, alles da. Ideal für 2 Pers. Location accessible à 15'de santa cruz. Bien localisée pour visiter l île. Très bon accueil, tres bons conseils, magnifique propriété, une petite Lola adorable, vous pouvez y aller les yeux fermés. Thanks - We are glad that you liked it. 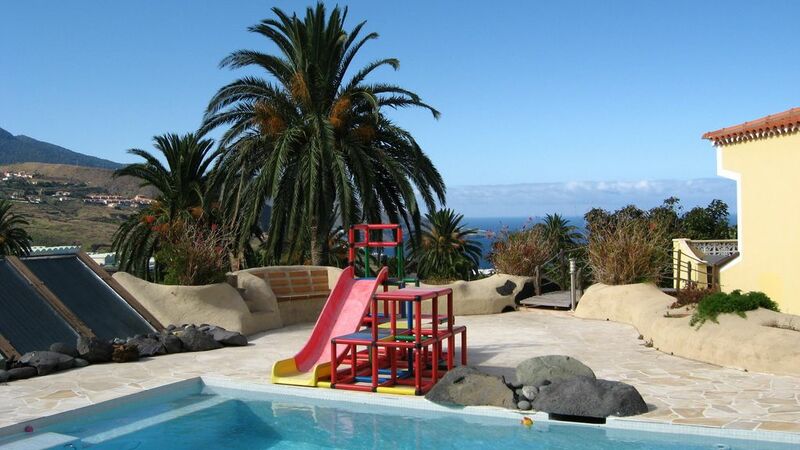 Palmasol is a village in the municipality of San Pedro de Breña Alta on the east side of La Palma in a pleasant altitude of about 260 m. By car, you each have about 10 minutes to the beach Los Cancajos, in the capital Santa Cruz de La Palma and the airport. But also a bus stop is just 300 meters away from us. Möchten Sie 3 Wochen oder mehr bei uns verbringen, so fragen Sie nach unseren Sonderangeboten für Langzeitmiete ! !